Probably every hobby pilot's dream is to fly to exotic places and to add a few spectacular entries to the log book. As I embarked on my "flying vacation on Hawaii" in 1999, everything was a big unknown to me. One year later, in 2000, Peter N. Forman published a book with Barnstormer Books packed with tips and information for pilots who would like to fly on Hawaii. I ordered this book and to my delight I received it signed by the author. 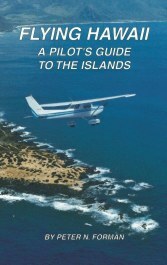 I recommend to read this excellent text by every pilot planning to make an aerial vacation on Hawaii! I hope that these images will reflect at least a part of the "magic of flight." See what we see when we fly, look at the magnificent landscape from aloft! AMAZING Aerial photos!! , you know you should really try to make an album in this site, www.trekinu.com .I think you could love the idea of marking the photos on map. What fun !!!!! I actually felt like I was there .. again !! Used to live on Oahu and like a typical 'local' you don't take pics and go to all of the places that tourists go.. but you have certainly made my Sunday most enjoyable looking at all of your pics !! Thank you !! We are going to Oahu in 3 weeks and finding your site was awesome. We've been to Hawaii before but had no idea where to look for Robin's Nest. I really enjoyed your photos. excellent quality and detail. How much FUN it must be to fly over the islands! Thomas,thanks a lot for posting your flights,I enjoyed it a lot to go through.